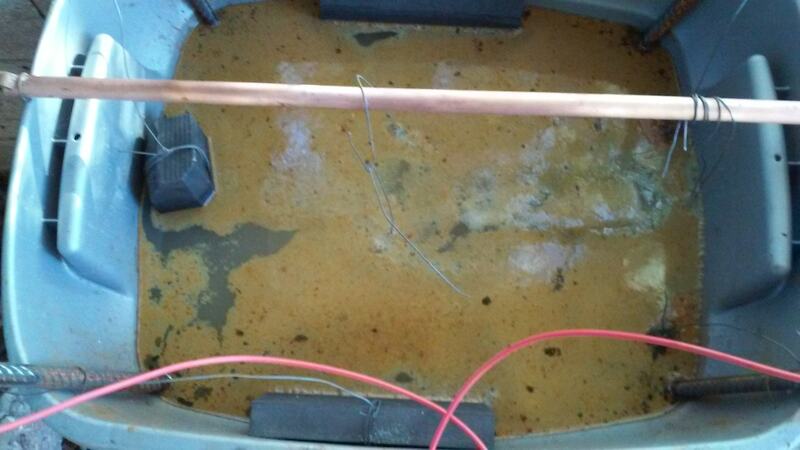 Electrolytic rust removal. Why aren't you using it? 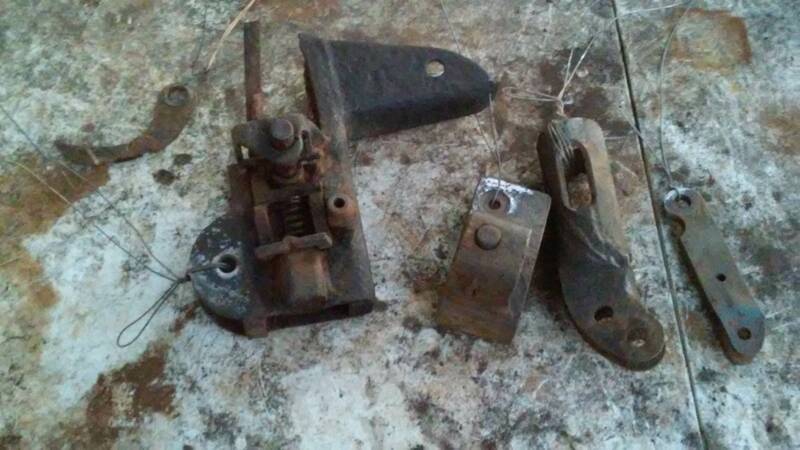 Everyone has some rusty tools/junk/etc. laying around right? 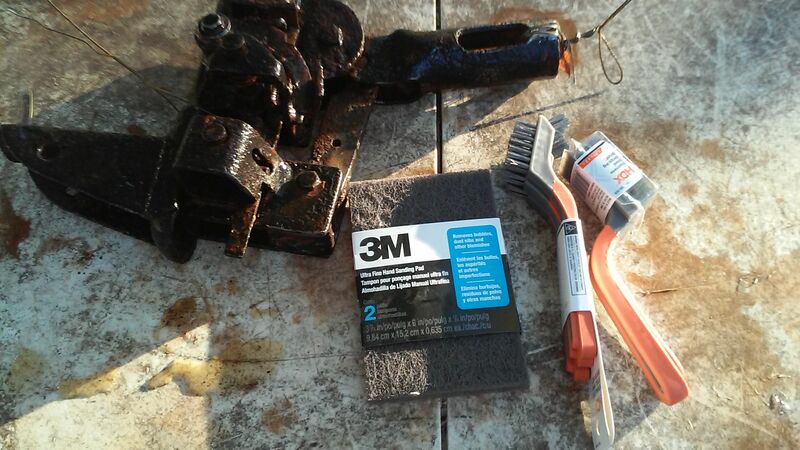 Some rust removal methods are destructive to the good metal underneath the rust, and/or require a lot of elbow grease. Some of the chemical means of rust removal are expensive and pretty toxic. I'm lazy, I don't like buying toxic chemicals, and I have tons of rusty junks laying around. Museums use electrolysis, why shouldn't I? It doesn't require toxic chemicals and it's cheap. You can even dump the used solution on your lawn, or reuse it indefinitely. 1. A DC power source. Most people seem to use a "dumb" battery charger. The new "smart" chargers won't work for this. 2. 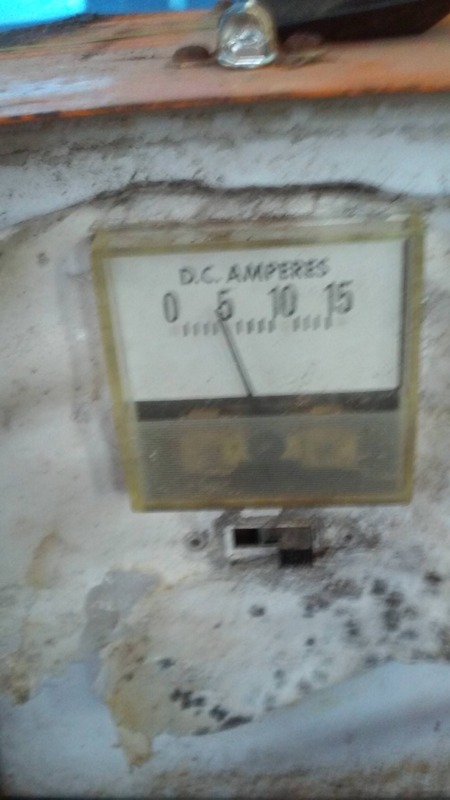 An ammeter. Most of the old "dumb" battery chargers have an ammeter built in. If it doesn't, you can buy a cheap one to wire in series. 3. A non conductive container large enough to hold the part to be de-rusted. I've seen everything from tupperware dishes to kids swimming pools used. I've also seen wooden boxes constructed and then lined with plastic sheeting or tarps. 4. Water. From the tap, well, distilled, whatever. 5. Sacrificial anodes. 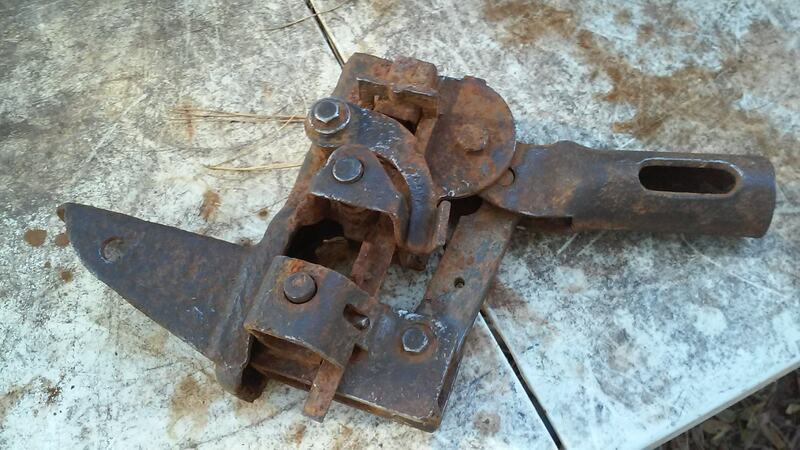 These can be junk pieces of scrap steel or graphite rods/plates. I've used both and greatly prefer the graphite. Much cleaner. Graphite isn't expensive and is easily found on ebay/amazon or at places like mcmaster carr. 6. Some way to suspend the parts in the solution. Plastic/metal/wood doesn't matter as long as it will hold the weight of the part. 7. Steel wire. I use bailing wire because it's cheap and easily available. 10. Scotchbrite pads. Gray seem to work the best, but any will work fine. 12. New paint or other finish of your choice. 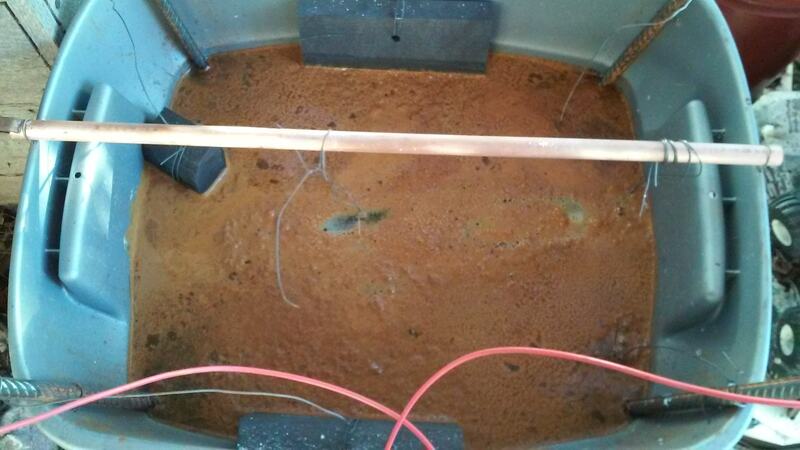 ***IMPORTANT*** DO NOT use stainless steel as a sacrificial anode. You will create hexavalent chrome by doing so. Here's mine. Pretty simple. 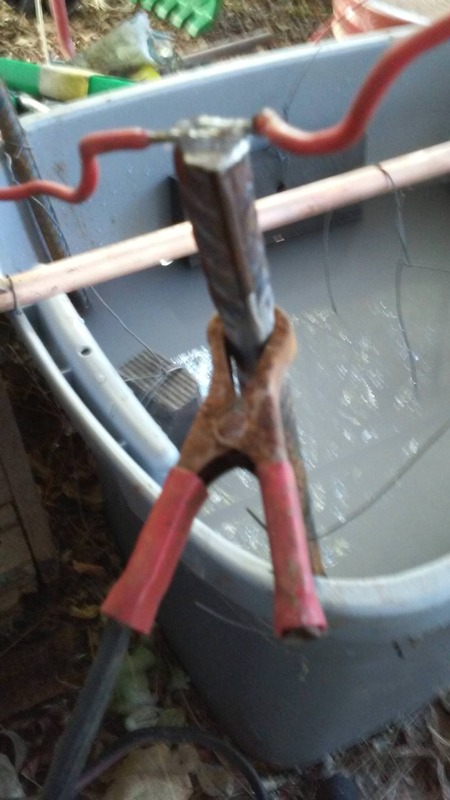 Rubbermaid tub with four pieces of rebar tied together with copper wire. These are sacrificial anodes, but I have tied additional graphite anodes to the rebar with bailing wire. The bar across the center is a scrap piece of copper pipe I had laying around. I used rebar for this last time, but it was nowhere to be found. Washing soda. It's less than $5 for a little over three pounds. That's more than enough to drain and refill this particular tub many times, though doing so is unnecessary. The solution can be reused. Just skim the nasty stuff off the top and add water to replenish what's lost to the process and evaporation. Here's the power source I used, an old "dumb" battery charger. I got this for free, installed a new power cord, and it works. Beyond that, I can't tell you anything about it. I have no idea of it's current output capacity, though I would guess it at 8-10 amps. The ammeter works, and is pretty accurate as a bonus. Here's what I'm going to clean, scrapyard fresh. Pretty rusty, with a lot of caked on dirt. No oil or grease, which means less cleaning. Any dirt, grease, oil, loose rust, etc. needs to be removed. Again, I'm lazy so I used a wire brush on a 4.5" angle grinder. I've cleaned it up and disassembled it as much as was possible at present. 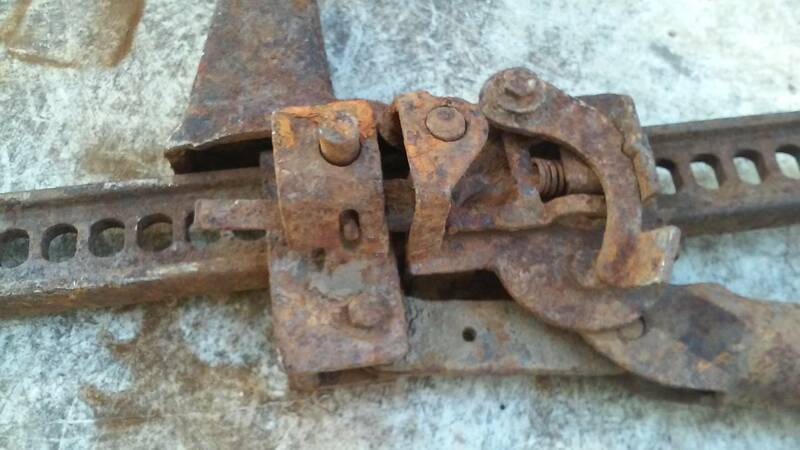 The bolts are rusted solid and the cross pins that hold the climbing pins are also rusted in place. It needs de-rusting before further disassembly and any more rust removal. This process will require good electrical connection at the point it is connected to power. I sanded the points where my wire would touch to bare metal. The process works in a "line of sight" manner, so the more area that's exposed to the sacrificial anodes the better. 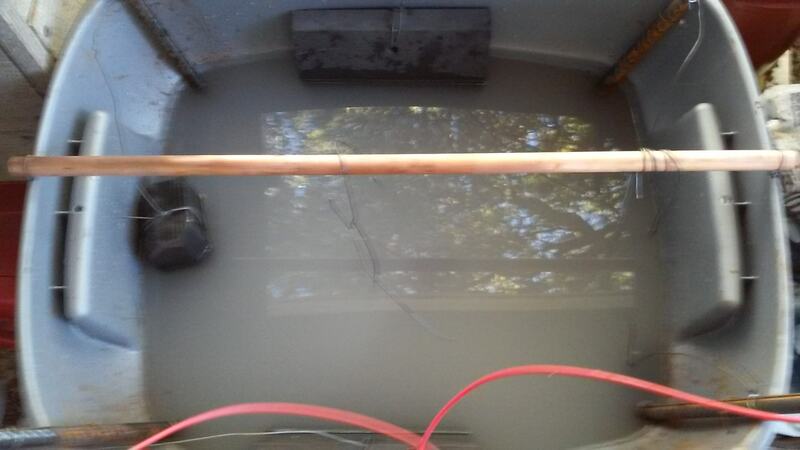 Here's the tub with 10 gallons or so of water in it and a cup or so of washing soda mixed in. The concentration of washing soda isn't all that critical. 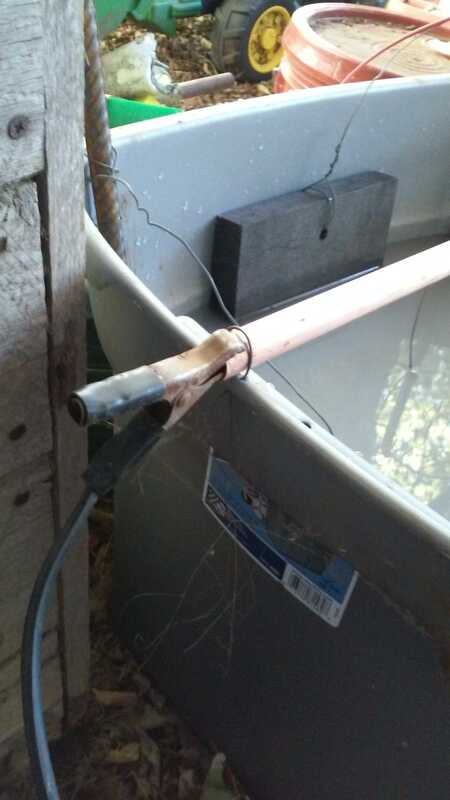 I've also "suspended" the jack body via bailing wire from the copper pipe running down the middle. Sorry it's blurry, I didn't realize until it was computer screen size. I just stated that the washing soda concentration wasn't critical, and it really isn't. That said, higher concentrations will allow for more electrical conductivity. This isn't a problem as long as the power source can handle it. Start with a tablespoon per gallon and go from there. You can also adjust current consumption by the surface area of your sacrificial anodes. Larger anodes equal more current consumption. Mine are pretty big, so I changed the concentration. Connect the positive from the power source to the sacrificial anodes. I soldered copper wire to the top of the rebar, so all of them are connected together. Connect the negative from the power source to the part, or in my case, the bar my part is suspended on. Now I plug the charger into 120v and turn it on. Unfortunately the picture I took didn't show the bubbles that immediately formed due to the light and murkiness of the solution. 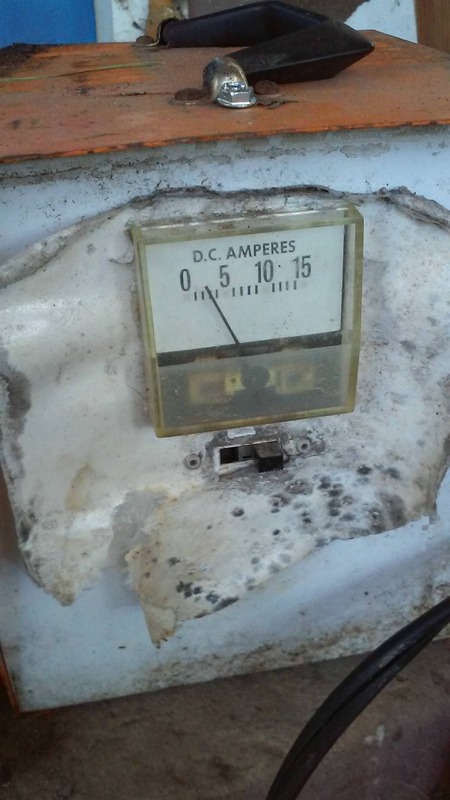 Even so, the ammeter shows that there is good electrical connection and work is being done. A little while later I added a bit more washing soda to help speed things up. Here's what the solution looked like after about an hour. And again after about another hour. Here's a vid showing what it looks like while running. I just went out and checked it again. The layer of gunk on the top is getting pretty thick and it's still showing about 5 amps. That's good since it means I haven't lost electrical connection due to gunk buildup on the anodes or a fouled wire. All in all, it took me longer to set the tank back up and refill it than it took to run the brush over the entire jack and sand a spot to get good electrical connection. Other than occasionally checking to see that it's still running, there's no more work until the part comes out. I'm guessing it will need to run at least a few more hours before it's done all it can. 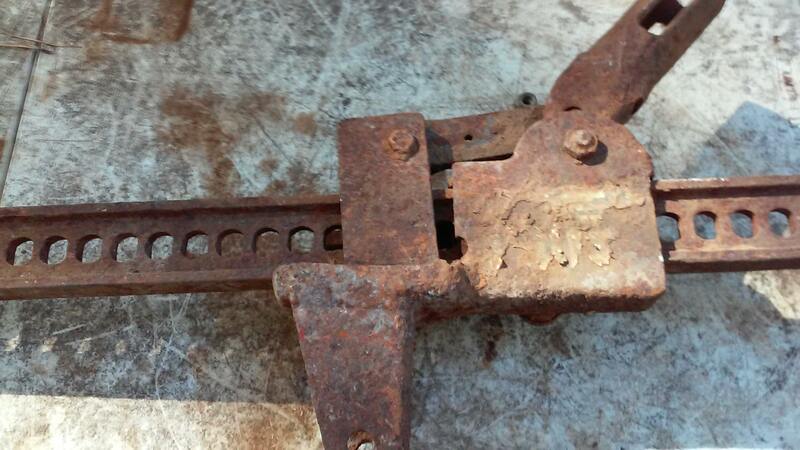 It's likely that it will still have some rust in areas that aren't "line of sight" to the anodes. So, this will continue later. 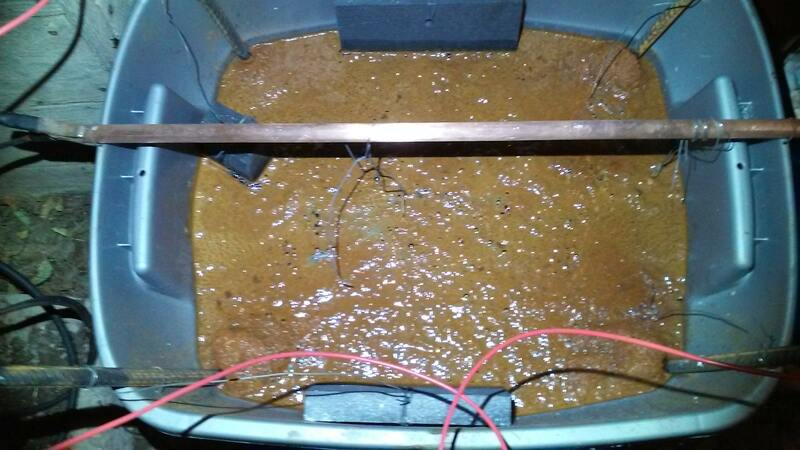 Re: Electrolytic rust removal. Why aren't you using it? I used electrolysis some time back. Funny, I used washing soda too due to the high ph. I 'found' a pair of pliers I forget under a car that was outside all winter. Initially I used a metal coffee can as one electrode with some D cells and a bulb in series as a current limiter/ safety. It took a while but the pliers are serviceable and back in my tool cart. They have some missing steel from the heavy corrosion but they function again. That was the largest thing I ever attempted. Later, using a constant current power supply I cleaned some coins too. Do beware cleaning coins is not usually a good idea and can ruin their value. Low current and patience are needed, but if the coin is of value it's probably best to leave it alone. One day I'll try a silver plated spoon. I have often used vinegar and salt for fast metal cleaning and the system here looks good though. I've used vinegar, it works pretty well. I've never tried adding salt, might do that in the future. I forgot to mention a few things earlier, so now is as good a time as any. This process creates hydrogen gas. The amount, at least for something like what I'm doing is miniscule and unlikely to ever create a problem, but it's something to keep in mind if you're doing this indoors. Also, I don't understand the chemistry of it, but washing soda is preferred for this. Baking soda can be used, but it should be spread as a thin layer on a cookie sheet and baked in an oven first to get rid of the excess water molecules....apparently that's the major difference between the two. Maybe the video will post this time? My rusty junk "cooked" for about four hours yesterday. 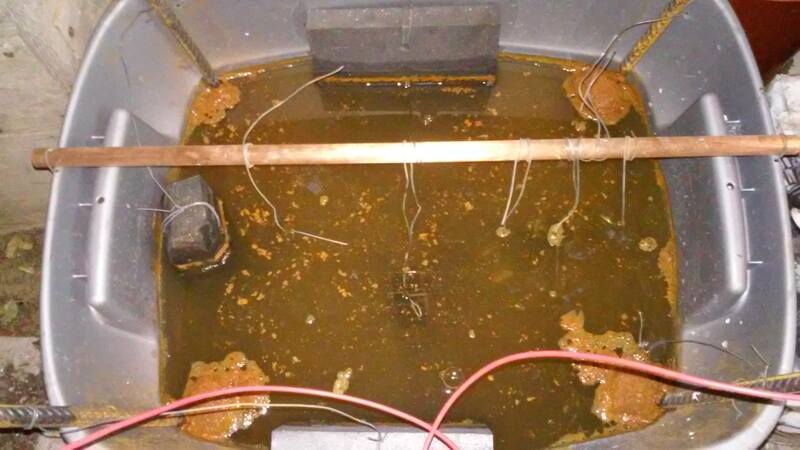 Here are a couple pics of the "soup" before I went to bed last night. I pulled it out of the tank earlier to see how it had progressed. Also picked up some new brushes and more scotchbrite pads on the way home. When a part comes out, the "clean" areas will have a layer of black....oxide? that needs to be scrubbed off. That's what the scotchbrite pads are for. Give it a rub and rinse with clean water. Sometimes you find things you didn't know were there. An example would be finding this after giving it a little rub and rinse. Note the clean, shiny steel. I didn't bother doing much rubbing/rinsing since I knew I would be putting it back in for more derusting. The downside to using electrolysis on assemblies is that quite often you need to attach wires to multiple points, otherwise there won't be enough electrical connection to de-rust every part of the assembly. That was true in this case, although there was enough to get the rust off the nuts/bolts to allow further disassembly. I got the nuts/bolts loose, put on some more wire, and hung everything back in the tank to cook a while longer. 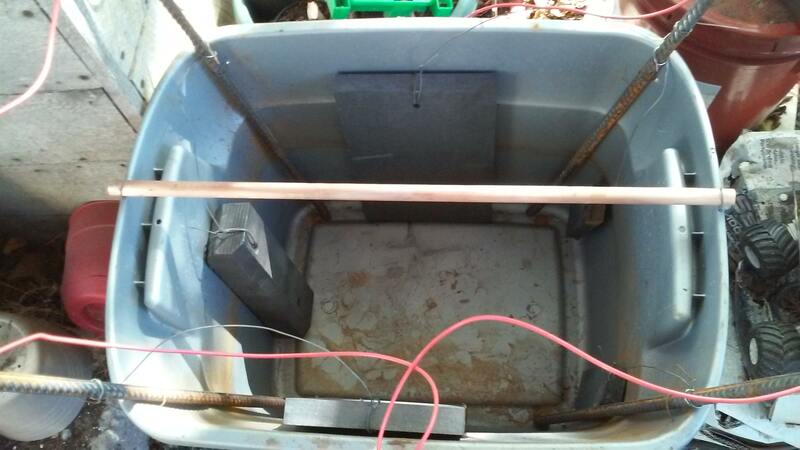 Once all the external rust is gone, I'll have to move things around so that I have sacrificial anodes inside the cavities to get the last of the rust. Great thread, thanks ! I had never heard of such a thing, and your pictures and explanation are very good. The electrolysis method does appear less damaging to 'good' metal than the vinegar and salt (forms a mild acid) method ,though immersion time is a bit less .I use the vinegar and salt method to clean the white to green GUNK out of battery holders when a dry cell or alkaline cell has leaked and damages the metal 0f a battery holder. I've tried this method, and haven't had much luck with it. But now that I read your post #1, I think I may have it figured out. I'm using a newer model smart charger. I've tried a couple of different models and it works at first, but there must be some kind of circuit breaker or fuse in the battery charger. It's on my list of projects to figure out, but got moved to back, behind the back, burner. Carl, there are two ways that electrolysis can damage the good base metal. The first is by connecting the positive and negative incorrectly. If the positive is connected to the part, it will eat away the part instead of the sacrificial anode(s). To some extent, excessive current flow could also do this. The second manner of potential damage to the part is hydrogen embrittlement, which is caused by excessive current. It's easy to detect excessive current during this process. If the electrolyte solution is much warmer than ambient temp, the current is too high. Even if your power supply outputs a "fixed"(it's not actually fixed, there just isn't a knob to adjust it) level of current as do most "dumb" battery chargers, this isn't a problem. As I stated earlier, the amount of current can be reduced by changing the concentration of the electrolyte solution or by the size of the sacrificial anodes. 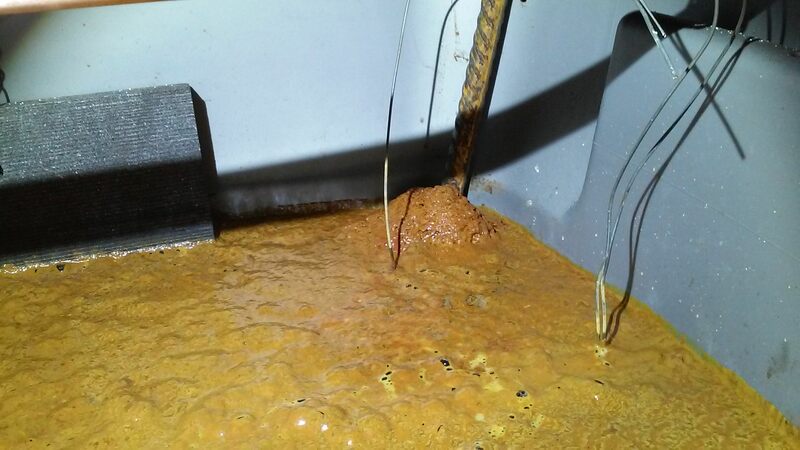 There are also other methods to reduce current flow, such as increasing the distance between the anode and cathode(the part you're trying to de-rust), or by reducing the amount of anode that's in the solution. I suppose one could also add a resistor between the power supply and the part as well. tx_floods: The "smart" battery chargers look for an incoming voltage from the battery. I believe they do this to check for dead shorts in the battery cells or between cells. If the voltage is too low, the charger will automatically shut off. In the case of charging batteries, this is good since there isn't any point in trying to charge a shorted cell, which may overheat and start a fire, etc.. Likewise, if the charger has been running for a long while and the battery hasn't reached "fully charged" state(according to whatever the designers wanted for a set point), the charger will shut off. Again, it's "thinking" there is a problem with the battery. In all honesty, they are probably looking for a load(not voltage) within a pre-programmed set of parameters. Anything above or below that triggers a shutoff to prevent damage to anything. Mountainmomma: Glad you like it. I just did a search on amazon for some graphite rods to use as electrodes, and found some carbon arc gouging rods. I was about to order them until I saw that they were 80% graphite and 20% copper. Do not want. The copper will end up in the electrolyte solution, and can actually plate onto the part you're attempting to de-rust. Pure graphite is what should be used. I havent tried this, but if a zinc electrode is used to derust steel it may plate some zinc onto the iron, similar to a light galvanizing. Excellent wrietup. It's been several years, but I've done your same exact method on rusty hand planes. I used this method several times to restore old firearms. It works very well and is so gentle on the metal. Yes. That's pretty much what I ended up ordering. I wanted to mention the arc gouging rods though, just so nobody would make the mistake of buying them for electrolysis. No problem using them for arc gouging though. Stwood: I have a hand plane or two that will get a dip. As soon I have some smaller electrodes(didn't want to cut up my big plates) I will update with a different setup to get the "hidden" areas. The small electrodes came in yesterday but I didn't find them until this afternoon. I'll have to construct another tank arrangement and make some new power wires, so I should have pics of a new setup in a few days. Today was my b-day, so nothing got done. Got family dinners and stuff most nights this week. I will hopefully get a little time to work on it tomorrow after work.